This is my solar powered lamp. I made it myself. I had a cheap solar powered outdoor light that I never used in a yard; I used it in my van as a nightlight. I’d leave it in the sun all day, and by dark I had a nightlight that lasted almost until morning. It wasn’t bright enough to read by, but it provided me with enough light to find my phone or my keys in the middle of the night. First the long part meant to go into the ground broke off. After rolling around on the floor of the van for a while, the plastic protector around the tiny light bulb broke too. I thought I had nothing but a piece of trash, but for some reason, I didn’t throw away the chunk of plastic housing the light bulb and the solar panel. I stuck it in the pocket on the van door and forgot about it. While I was cleaning the van at the Rubber Tramp Rendezvous, I found the light bulb/solar panel combo. I thought I’d drop it off at the free pile in the event someone could use it for something. Then I thought, maybe I could use it for something. I thought about how I could use the light and solar panel to make a lantern. 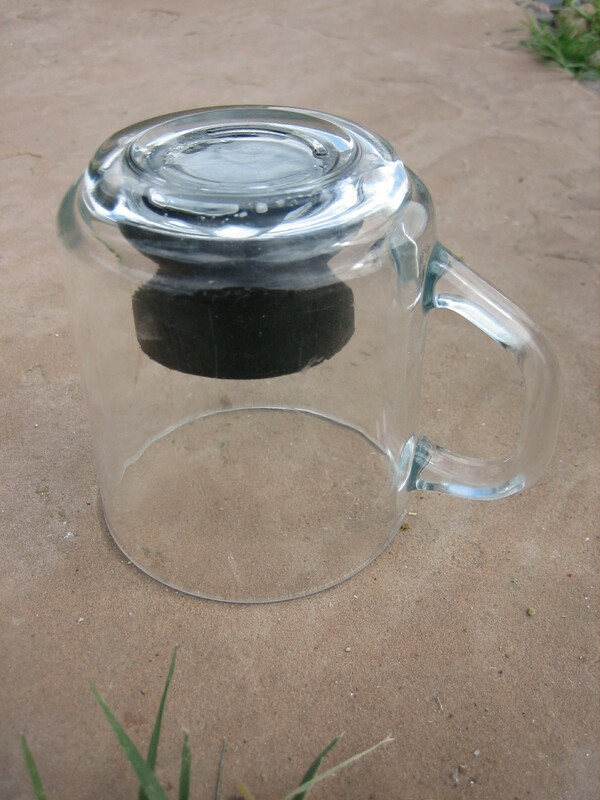 My first idea was to glue the bulb/solar panel piece into a mason jar. I knew the solar panel had to be able to receive sunlight in order to charge the battery inside. 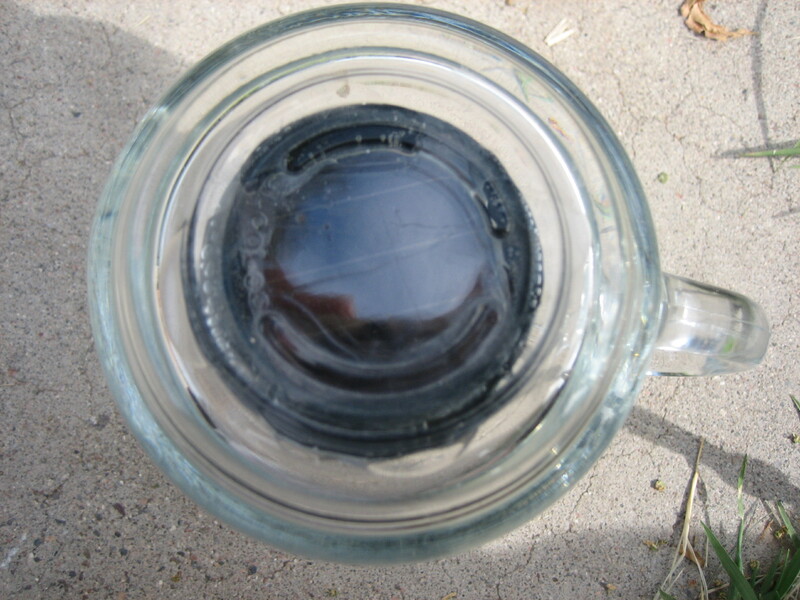 So I thought I’d turn the mason jar upside down so that the lid sat on the table (or floor or whatever surface of my choice) with the light bulb facing down and the solar panel facing out of the glass. The next time I was at the Quartzsite Salvation Army thrift store, I took a look at the mason jars they had for sale. Nothing seemed right. Then I saw a sturdy, thick glass mug for sale for a quarter. AHA! This is what I see when you look down into the mug as if I were about to drink from it. The light bulb is facing up, but when the mug is flipped over so the sun can reach the solar panel, the light “hangs” from what is then the top of the mug. 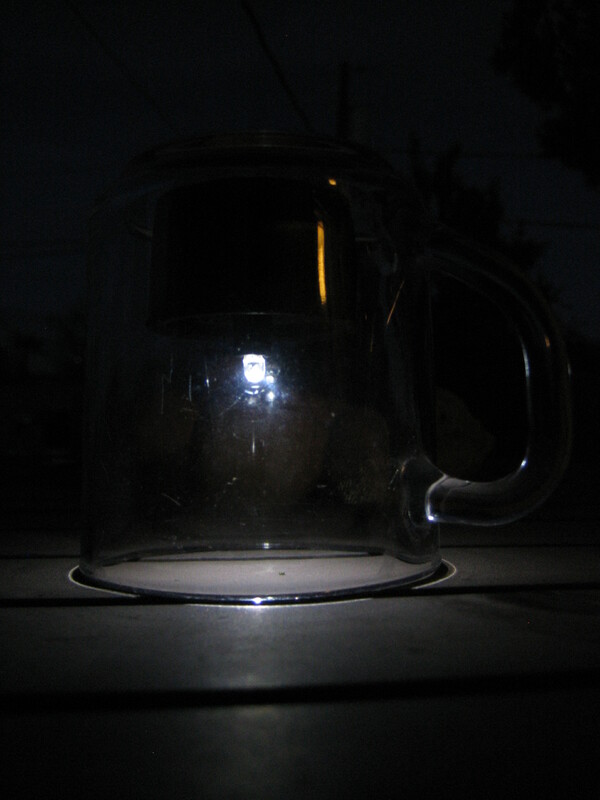 The glass allows the light to shine out of the mug. 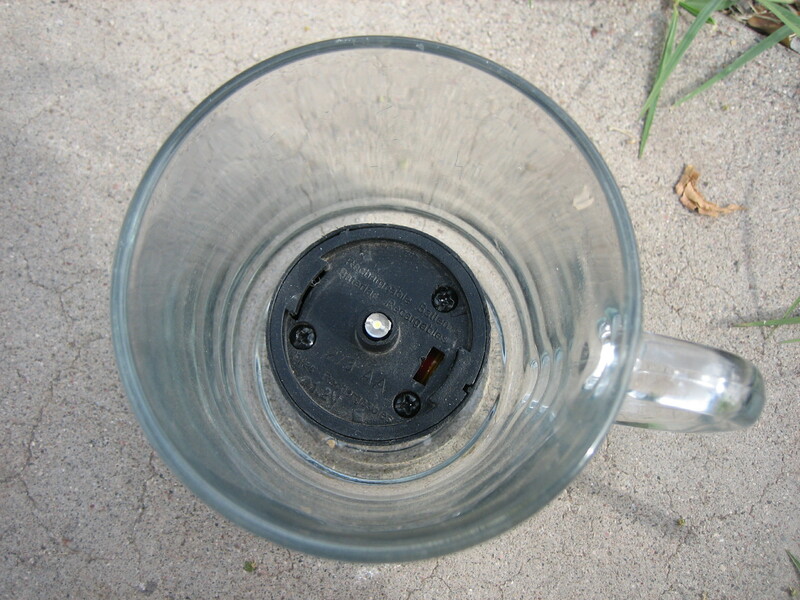 This is the solar panel glued to the bottom of the mug, facing so the sunlight can reach it. The original cost of the yard light was 99 cents. Even if you add that to the 25 cents the mug costs, plus a penny’s worth of glue, the lamp only cost $1.25, But when you figure I was about to toss the solar panel/light bulb, and I already had the glue, this really only cost a quarter, and kept two items out of the landfill. Here’s my solar lamp lighting up the night.